Let me tell you - I STRUGGLED with this. Two stencils on top of each other - without making it a mess? Anni showed me a card that inspired her and that was when I realized that using one stencil as a background and using the other one to create a focal point would work. Even using two different techniques would make it stand out even more. My first attempt DID look messy though. And I didn't finish the second one because I didn't like the over-all design. I wanted to create a super subtile background with cold colors, so I used distress inks (evergreen bough, broken china, stormy sky, chipped saphire) and belnded a background. Then took a stencil with waves, sprayed water on top and laid it onto my blended panel. See that subtile texture? Love it? So I was happy with the background - first goal achieved - yay! 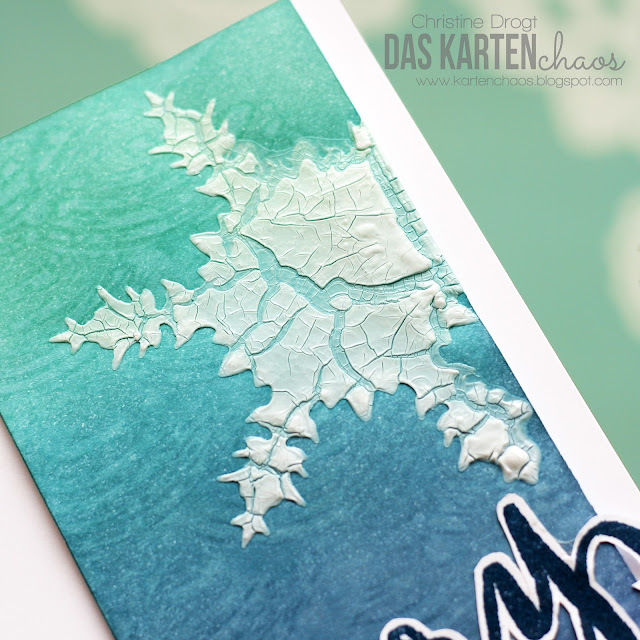 For the focal point I cut a stencil with a Memory Box die (Bianca Snowflake). I wanted to used my new best friend called Crackling Paste, but I knew that the translucent paste would get lost on that background. So I mixed the Crackling Paint with some picked Fence distress Paint - which is an Opaque white ink. So it's kind od semi-translucent now and I love that look! Looks cold, frosty and beautiful, right? 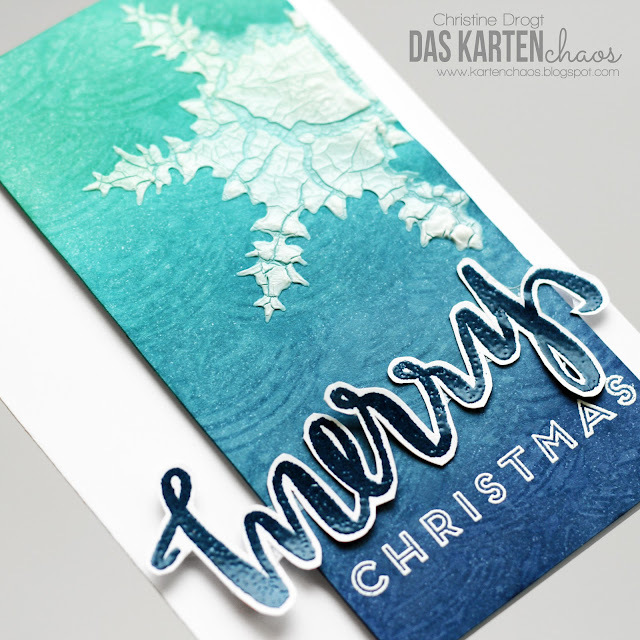 So I stamped and embossed the sentiment, fuzzy cut the "merry" and assembled the card. I a so happy I did not give up after the first try. Do you ever struggle with challenges and make multiple cards until you have one that you really love? Waah, der Effekt auf der Schneeflocke ist der Hammer - sooo schööön! Und wunderbare Farben! Was für ein spannender Hintergrund!!! Wow Christine this is awesome, love the way the snowflake turned out! Awesome! Absolutely brilliant use of stencils and paste. I'm inspired and have learnt so much from your post. Thanks for sharing at AAA Cards. Oh my Christine! Look at all this gorgeous texture! 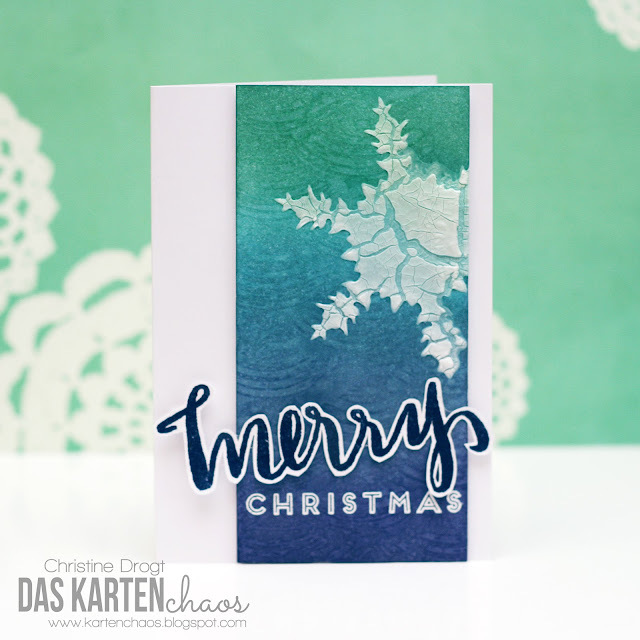 This came out awesome, I really love how the snowflake looks against the background! Very cool mixed media card, I'm glad I clicked through because there's so much depth to this card you miss it if you don't look close. Thanks for joining us at the Friday Mashup! Amazing card, stunning design and brilliant explanation!